Show your team spirit Sports Clubhouse to fire up your party. Start your sports enthusiast out right with all their fellow fans having the chance to join in the fun. This castle presents the variety of sports available to your young stars and give them the chance to open up their imagination. JumpMaxx gives you so many choices and we are proud to offer this moonwalk to get your party moving. 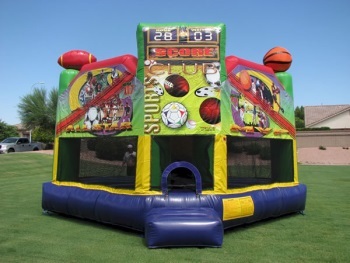 JumpMaxx prides ourselves in providing America with newer, cleaner, high end entertainment with inflatables like the Sports Clubhouse and many others.